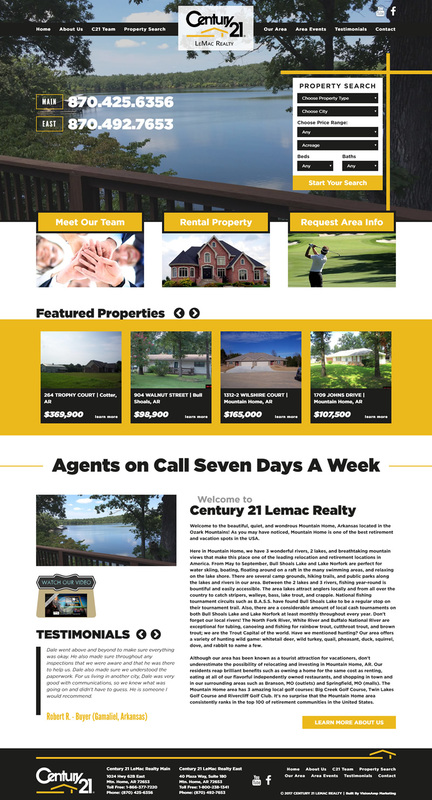 VisionAmp Marketing and Century 21 LeMac Realty built a website several years ago, and it was time for a fully responsive, mobile friendly upgrade with a fresh new design. The site is built for users to easily find the MLS property search, and to highlight their two locations in Mountain Home. They also offer a local Property Rentals page that they want to update often. As always, our sites are custom designed and built for the client to update the content easily. Century 21 LeMac Realty is a full service, award-winning real estate office with two locations and over forty real estate agents in Mountain Home. They service north central Arkansas and southern Missouri.. Contact Century 21 LeMac to buy or sell residential, commercial, land and farm real estate.